One of my fondest childhood memories in summer are the countless family BBQs that we’ve had, with brimming temperatures during the day, sun umbrellas all over my parents’ garden and my dad firing up the grill in the early evening. It was just that typical summer scent in the air in my hometown as there were BBQs happening pretty much everywhere up and down the street, and also my parents pretty much arranged at least one a week. In my early 20s I remember having BBQs with friends almost every day during the summer – yes, I am totally aware, that that was a little extreme, but I was young & simply liked loved having a BBQ (& wasn’t vegan back then!) I am sure most vegans have been there at some point in their past. Even after going vegan & not having my own garden for the past few years (cause: hello London! ), the smell of a BBQ takes me right back to those summer days! One of the sauces that my mum always brought to the table was a fruity curry sauce, which I absolutely used to love. I am sure there were times where I’ve probably had more sauce than food on my plate – and who could blame me: that sauce was delicious! However, it was always a store-bought one and I actually can’t remember whether my mum ever attempted making it from scratch. 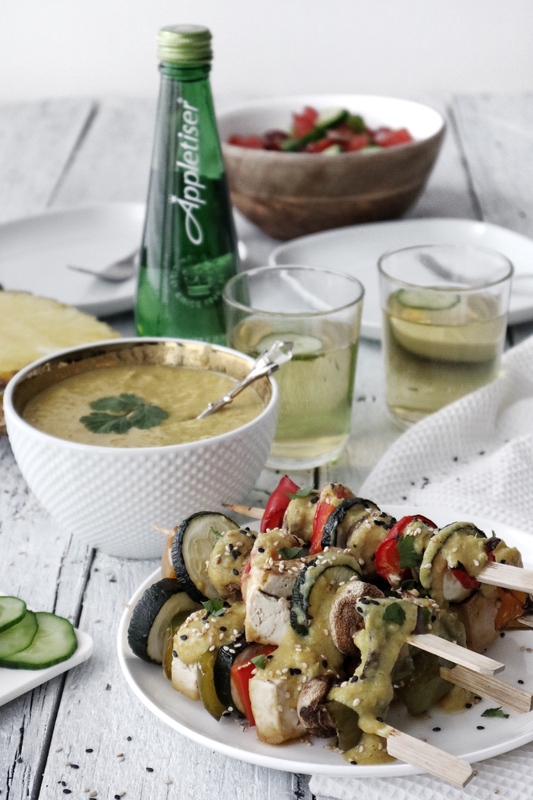 For the BBQ weather month of July I am happy to have teamed up with Appletiser to bring you this BBQ recipe – inspired by this fruity curry BBQ sauce that I loved so much as a kid, simply because I do love a good challenge of re-creating the flavours of my childhood! 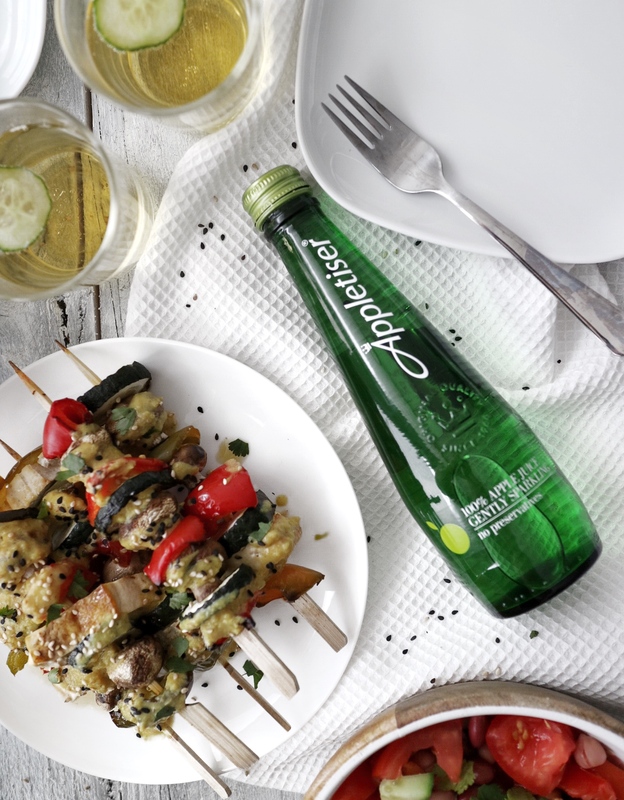 A summer BBQ & an ice-cold Appletiser simply makes the most #perfectpairing to battle the summer heat! 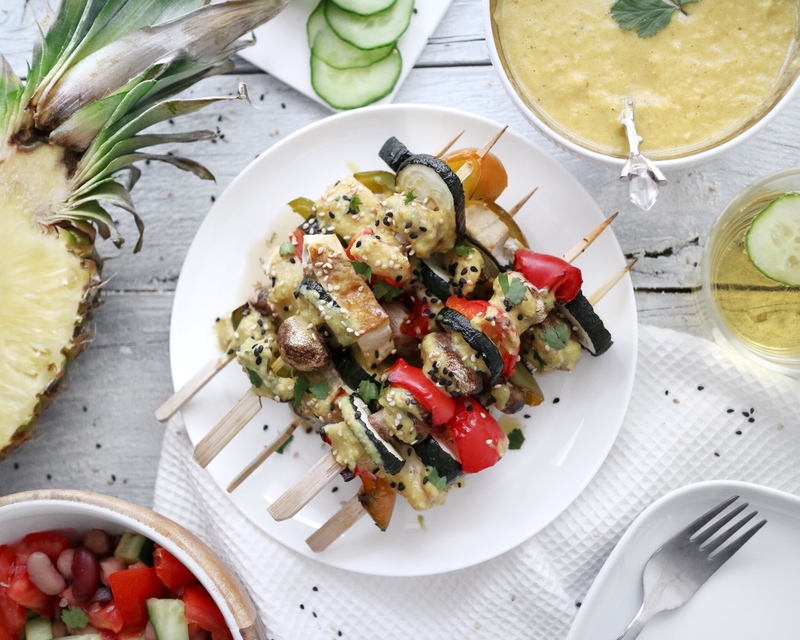 Of course these days, there’s only plant-power coming onto my plate – and I love pairing the pineapple & curry sauce with these delicious veggie skewers. These allow you to add up for favourite veggies before adding them to the grill – in my case that means: bell peppers, courgette, mushrooms & also some tofu that sneaked in between my veggie slices. 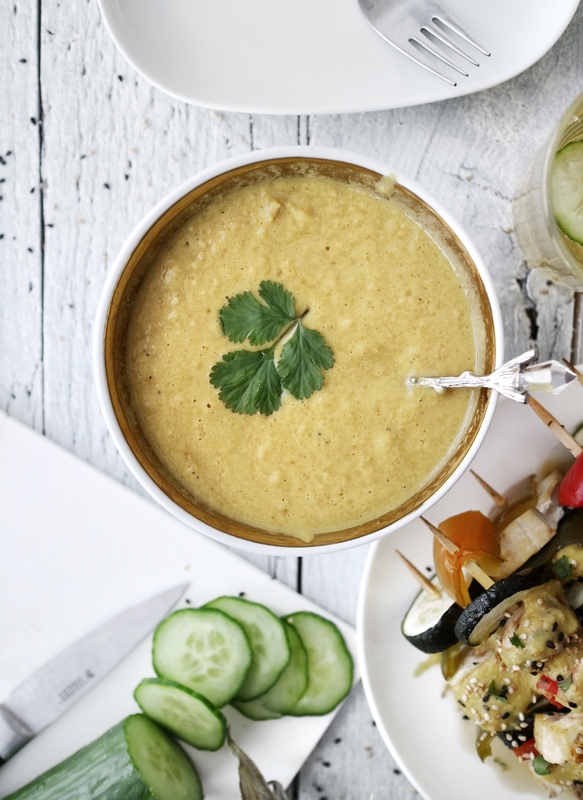 So set your Appletiser in the fridge, fire on the BBQ, and let’s get going with this recipe! 1. Start by washing & chopping your veggies (& tofu if you add some to yours!) into bite-sized chunks. If you use mushrooms, simply wash them and do not chop them, as they shrink when they are grilled. 2. 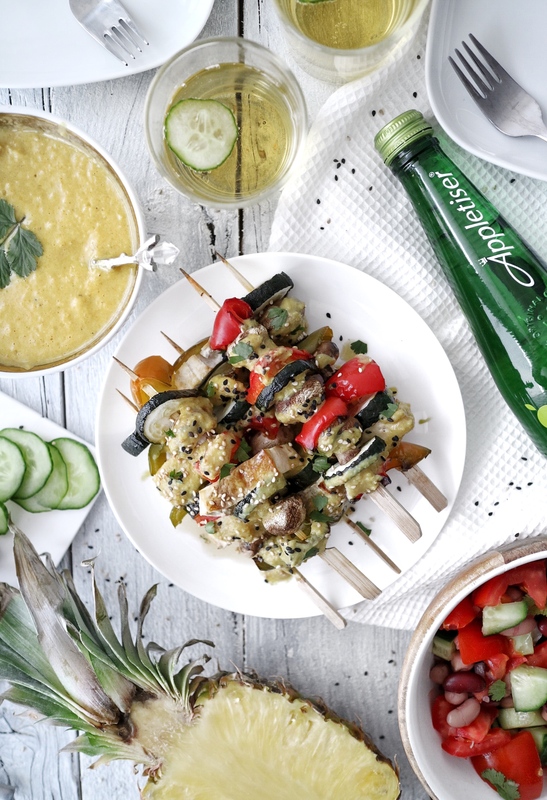 Add the veggies to your skewers, nicely mix them up to create colourful skewers. 3. Drizzle a little oil on top and place them on your grill. If – like me – you live in a London flat without garden, you can also place the skewers into your oven and bake them on the grill setting of your oven for about 10-15 minutes. 4. In the meantime, start preparing your sauce by chopping up the pineapple (skin removed of course!). 5. Add the pineapple to a high speed blender alongside the remainder of the ingredients. Blend on high until smooth, then transfer into a small dish to use for dipping. 6. 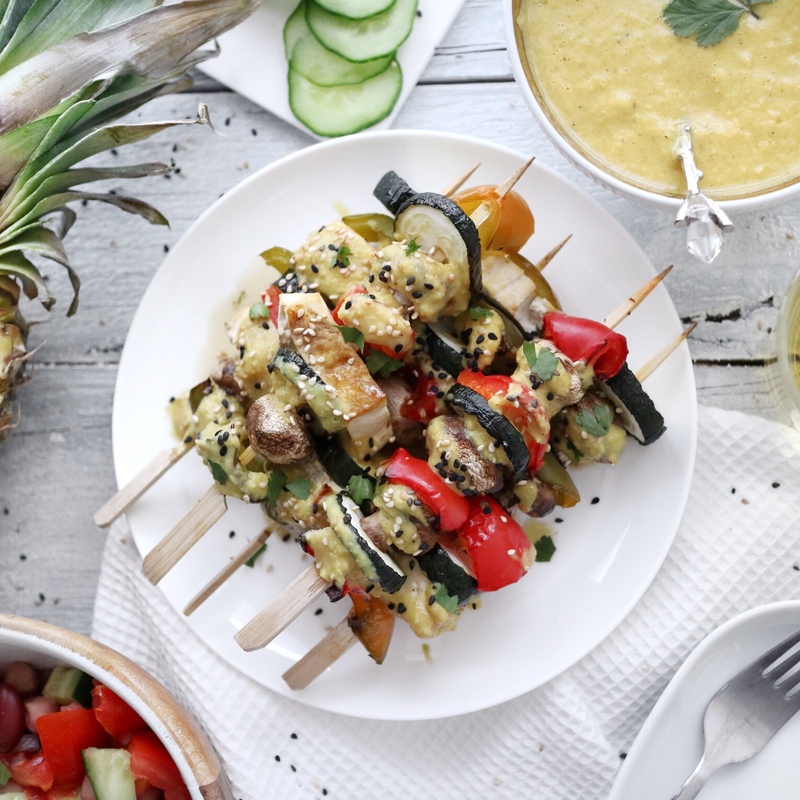 Once grilled, remove the skewers from the oven or grill, and serve with a little pineapple sauce drizzled on top! Don’t these simply look fantastic?! 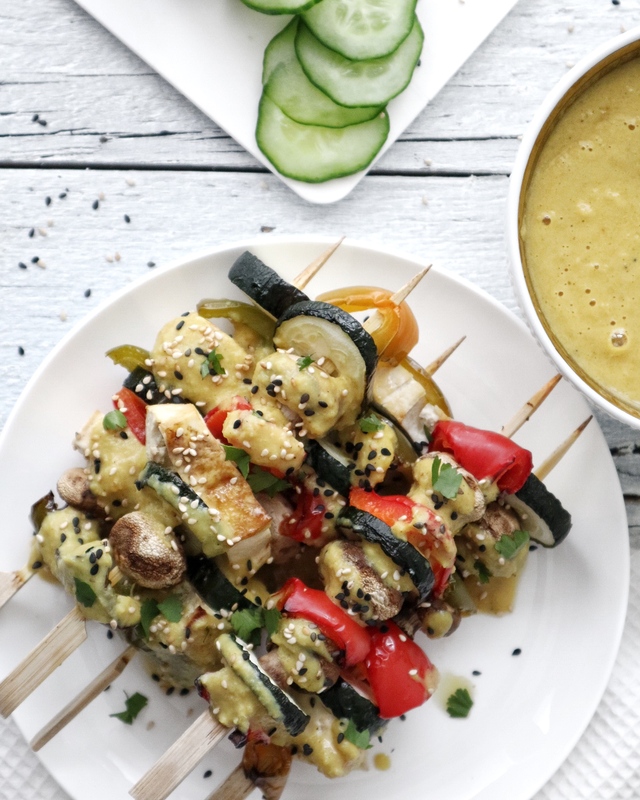 The Pineapple Curry Sauce definitely gives the skewers a good kick, hence why they don’t require any additional seasoning upfront apart from a little oil, salt & pepper. I also love sprinkling sesame seeds on the top – but let’s be pretty honest: If you’ve been following my blog for a while and have a good eye for detail, you can probably spot sesame seeds on most of my dishes, they are my secret weapon to any dish – I am simply addicted to adding the crunchy goodness on top of my dishes, I think the crunch simply adds an interesting note to the texture of my food. Why not create more plant-power to your BBQ? 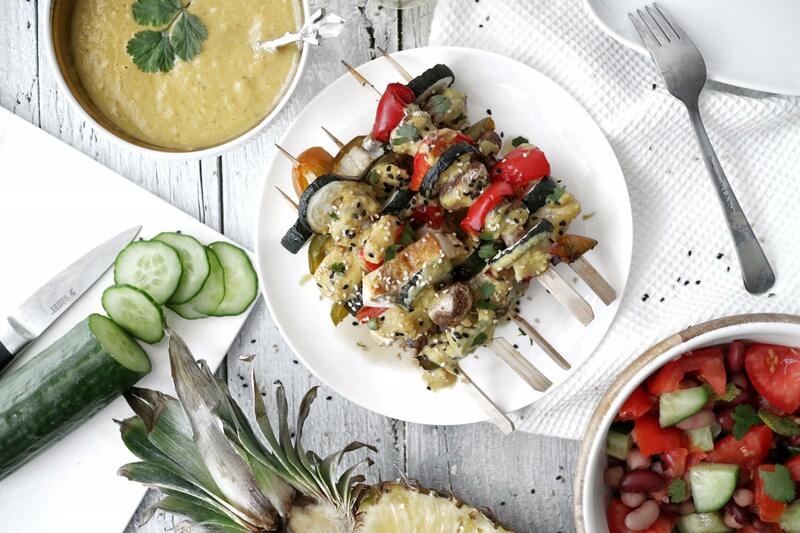 I’ve served mine with a side of mixed bean salad – just as beautifully colourful as the skewers and a perfect addition to any BBQ spread!